What are the gaps and needs after several Alpine Space projects in the pilot area Berchtesgaden-Salzburg? Which recommendations can be given for the further programming of European funds? These questions guided the discussions of a stakeholder workshop organized in Berchtesgaden in April. As main topics for future regional development, the participants identified landscape and agriculture. On 29 April 2014 a stakeholder workshop was organized in Berchtesgaden as part of the project greenAlps. 23 participants took part in the event. Next to several organizations representing the greenAlps project different sectors of the region were present, e.g. tourism, municipalities, agriculture, protected areas administrations. The workshop was organized within Work Package 4 – Governance in Pilot Areas. This Work Package (WP) mainly comprises the analysis of the main achievements and identification of the institutional needs, ecosystem services and good governance processes for a stronger implementation of the project results of ECONNECT and recharge.green achieved for and in the pilot areas. Against this general background of WP 4 the objective of the stakeholder workshop was to discuss the experiences of completed and current Alpine Space projects like ECONNECT and recharge.green in order to identify gaps and needs and to develop recommendations for the future in respect to biodiversity conservation, connectivity, and ecosystem services in the pilot area. 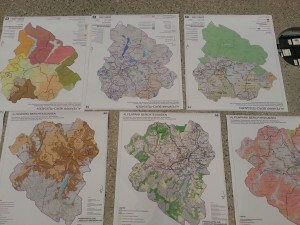 In order to prepare the ground for fruitful discussions during the workshop current initiatives in the pilot area related to the above mentioned topics were presented, like the development of the landscape framework plan for five municipalities in the region or the integrated concept for climate protection in the Landkreis Berchtesgadener Land. Apart from that the most important results of completed projects of the past years were presented along with the results of WP4 which had been elaborated until the workshop. The topic of regional development was a guiding theme during the workshop. In a widened sense it was considered as bracket for an integrated regional process based on participatory principles. It was stressed that such a process should comprise a comprehensive and cross-sectoral approach which covers the further analysis and implementation of different aspects like connectivity and renewable energy. In such a process the exchange and networking of different stakeholders beyond existing borders between sectors, countries etc. are important. During the discussions the participants acknowledged several ecosystem services provided by the biodiversity of their region, e.g. the high aesthetical value of the landscape which has a great potential for different types of recreational activities (e.g. hiking). Also alpine farming was considered to be of high relevance for the region. It means not only an important source of income and the production of regional goods in order to sustain regional cycles. The result of alpine farming at the same time contributes to the aesthetical value of the landscape as it creates the typical mosaic of forests and open spaces which make the landscape so interesting for many visitors. Like for the general regional development the participants stressed the need to develop an overall long-term concept for agriculture as a guiding principle for the region rather than implementing single activities without coherence. It was also proposed to develop a regional brand in order to raise the awareness of the importance of regional production and consumption. A follow-up of the workshop might take place during an upcoming workshop series organized by the Biosphere Region Berchtesgadener Land which will possibly pick up some of the topics discussed during the workshop. The workshop showed that most of the stakeholders are aware of the ecosystem services which are provided by the ecosystems in their region. Also the relevance of connectivity seemed to be obvious for most of the participants. Several gaps and recommendations have been identified for the future of the region giving valuable hints for the further programming of European funds.